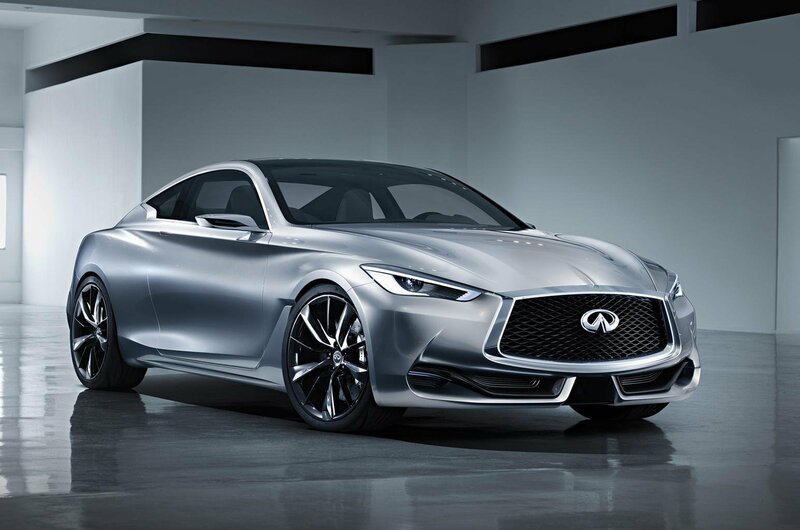 Infiniti Q60 concept revealed at Detroit show | What Car? The Infiniti Q60 has been revealed at the Detroit motor show, with the production version of the two-door coupe expected to go on sale in the UK in 2016. The Infiniti Q60 is a concept car at the moment, but has been described as being a precursor to a high performance sports coupe. It takes its visual cues from the Q80 Inspiration concept that was shown off at the Paris motor show in 2014. The Q60 includes elements such as dual exhausts and a prominent spoiler at the rear, and large air intakes at the front, along with Infiniti's large corporate grille and LED headlight design. It measures 4690mm long by 1865mm wide and 1370mm high, making it shorter, narrower and taller than the Q80 Inspiration. It is, however, marginally longer, wider and lower than the BMW 4 Series and Audi A5 coupes. Power for the Q60 concept comes from the same 3.0-litre twin-turbocharged V6 petrol engine as the Q80 Inspiration, in which it produces 444bhp. The engine is coupled to a seven-speed automatic gearbox. That engine is the first from a new generation of 'powerful and efficient' Infiniti powertrains which will come to market within the next two years. As the Q60 is currently only a concept, the equipment levels are not representative of what will eventually be offered as standard, but something that is likely to make it to the production car is the electrically adaptive steering system, called Direct Adaptive Steering, which first appeared on the Q50 saloon. The concept also comes with leather trim with carbonfibre accents, and individual bucket seats. Technical highlights of the Q60 include Infiniti's new InTuition system, which allows up to four drivers to save presets for audio, navigation, heating, ventilation and telematics settings. The Q60 is not yet confirmed for sale in the UK just yet, although it is expected to be offered from 2016. Pricing will be revealed closer to that date. The BMW 4 Series is the pick of the current crop. It is entertaining to drive and is well equipped, although it doesn't offer a more luxurious interior than the cheaper 3 Series. The Audi A5 is not as good to drive as the BMW, but does have a good level of standard equipment and offers strong performance.